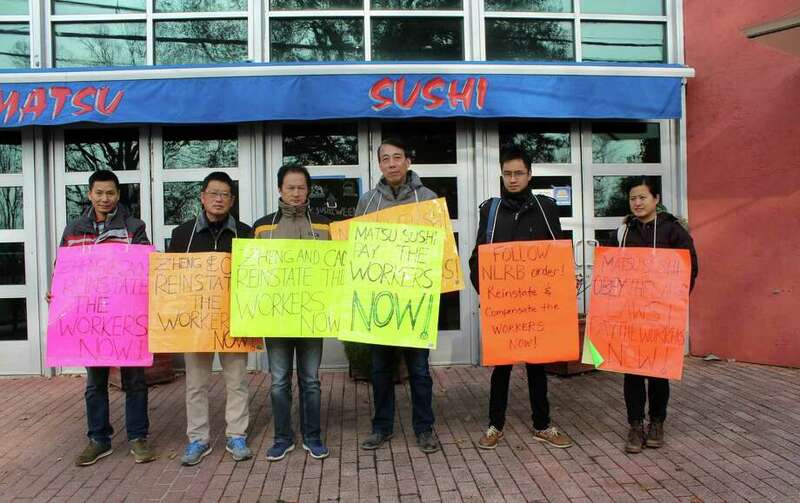 Former Matsu Sushi employees picket outside the restaurant on Nov. 19 in protest of Matsus labor practices. WESTPORT — A judge ordered two chefs fired from Matsu Sushi for refusing to complete a 36-hour shift be reinstated immediately, but the restaurant’s owners have yet to renew the workers’ employment. “We’re letting the community know this is happening and urging them to boycott and support the workers,” Sarah Ahn, an organizer with the Flushing Workers Center, said while protesting with the fired workers — Liguo Ding and Jianming Jiang — outside Matsu around noon on Monday. National Labor Relations Board Judge Kenneth W. Chu wrote in his Oct. 26 decision that said Matsu’s owners — Ziqiao Cao and Kim Ming Cheng — discriminatorily fired Ding and Jiang. Chu ordered the owners to immediately reinstate Ding and Jiang to their previous or equivalent positions and also provide the fired workers with backpay and other expenses related to their loss of employment. As of the day of the protest, nearly a month after the decision, Ding and Jiang had not been reinstated and Matsu’s owners could not be reached for comment. “They think they can continue to pay attorneys fees instead of fixing the conditions and following the law,” Ahn said. Ding and Jiang, both residents of Flushing, Queens, N.Y., contacted the Workers Center last December after Matsu’s owners allegedly fired Ding and Jiang for refusing to work a 36-hour shift in order to finish a large lunch order from Bridgewater Associates. Bridgewater, a Westport-based investment management firm, periodically put in larger lunch orders to Mastu. This prompted the restaurant’s owners to force Matsu employees to work from 8 a.m. until 10 p.m. the following night, Ding and Jiang said. In testimony before the National Labor Relations Board in July, Matsu’s owners said Ding and Jiang were not forced to work continuously for 36 hours. Rather, on the morning of large orders, they were permitted to sleep on the restaurant’s second floor at the end of the shift at 10 p.m. before resuming work from 1 to 6 a.m., with another break before the start of the 11 a.m. shift, according to the owners. Ding and Jiang, who both worked at Matsu for over a decade before their termination, said the 36-hour shifts harmed their health. 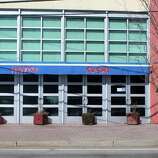 Last December, they told the restaurant’s manager they would work normal hours, but not the additional 1 to 6 a.m. shift in the event of a large order, testimony revealed. A week later, Matsu’s manager asked Ding and Jiang to work the 36-hour shift for the next day’s large order, and when they refused, she allegedly called to tell them not to return to work. After repeated calls in following days from Ding and Jiang, she did not give them an answer as to when they could return to work, according to the testimony. Customers trickling out of Matsu during the protest, however, seemed unmoved by Ding and Jiang’s unlawful firing in the eyes of the National Labor Relations Board. Both Ding and Jiang said they would like to return to work at Matsu. “We have been serving the community for a long time and know a lot of customers. I miss the Westport customer,” Jiang said.